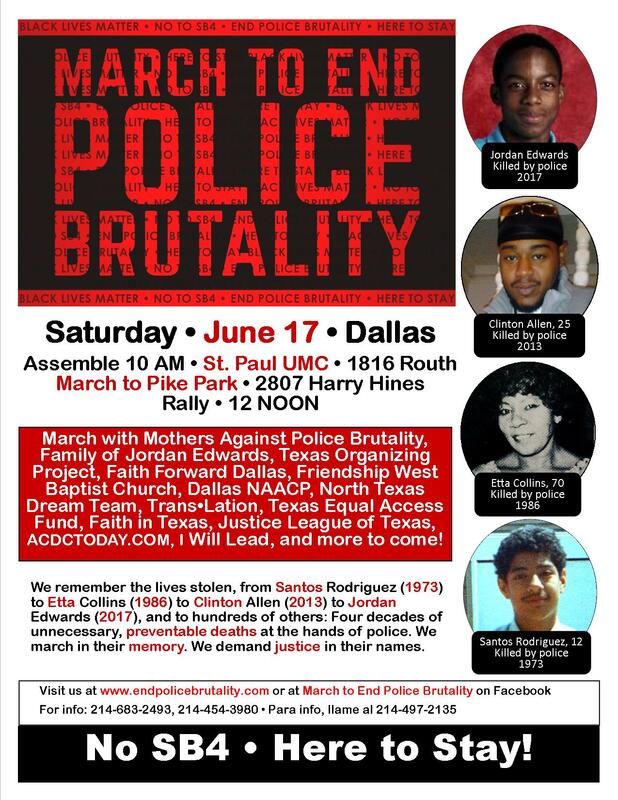 Join the March to End Police Brutality on SATURDAY, JUNE 17. This is the March to win justice for Jordan Edwards and other people killed by police in the Dallas/Fort-Worth area – and across America. This is the March to honor their memories, to support their families, and to lift every voice to end the national disgrace of unaccountable police violence against the public, particularly African American and Latino youth. Assemble 10 AM • St. Paul United Methodist Church • 1816 Routh • Downtown near Ross. This is the March to honor the memory of Santos Rodriguez, a 12-year-old child killed by Dallas police in 1973, in Pike Park near where Santos lived.This is the March to resist SB4 in Texas and to protect immigrant rights. This is the March to lift up the rights of women, refugees, and the LGBTQ community. This is your march! Join us! Spend part of your Father’s Day weekend to honor fathers who have lost a child at the hands of police. Spend part of your Juneteenth weekend building today’s Freedom Movement. 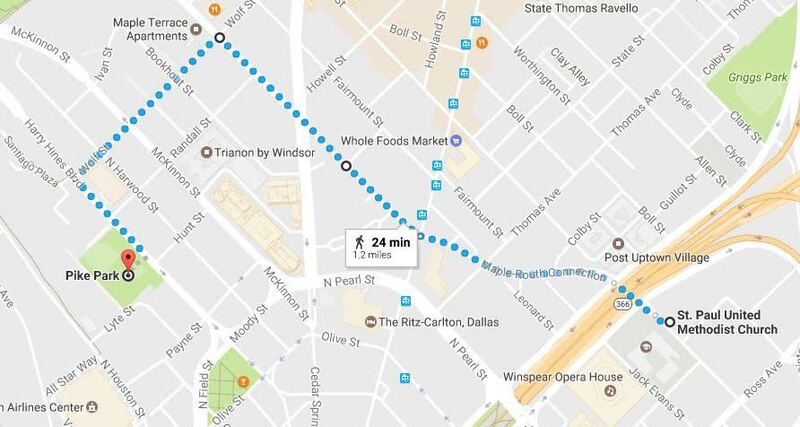 We are marching for justice for Jordan Edwards, an unarmed 15-year- old African American boy killed in Balch Springs on April 29, and the thousand other people who are killed by police in America every year. We are marching because 20% of those killed are unarmed, and 25% are mentally ill. We are marching because only about 1% of police who kill ever face a trial. We are marching to honor the memory of Santos Rodriguez and hundreds of other people killed by police in the Dallas / Fort Worth area since Santos, an unarmed 12-year- old child, was murdered by a Dallas officer in 1973: Clinton Allen, Fred Bradford, Bertrand Davis, Etta Collins, Jason Harrison, Gerardo Pinedo, Jr., Juan May, Ruben Garcia Villalpando, Christian Taylor, Jose Cruz, James Harper, and many, many others. We are marching to end the everyday harassment, racial profiling, and excessive force that people of color face from police officers, especially in small towns – as when Sandra Bland was arrested in Hempstead, Texas in 2015, and later found dead in her cell; or when Carmen Ponder, Miss Black Texas 2016, was arrested this year in Commerce. We are marching for accountability in policing and in opposition to the efforts of Attorney General Jeff Sessions and Texas Senator John Cornyn to rollback legal restraints on police misconduct. We are marching to protect the rights of immigrants. We are marching against SB4 and the other assaults by Texas Governor Greg Abbott and the Trump Administration on sanctuary cities that welcome and protect immigrants. We are marching for the rights of women, and in opposition to attacks on their health care and reproductive rights. We are marching for the rights of refugees and in support of providing asylum to civilians from war zones in Syria and around the globe. We are marching for the rights of LGBTQ people and in support of their right to live freely without harassment, isolation, and discrimination. For information about the march, visit March to End Police Brutality on Facebook. Para info, llame al 214-497-2135.